Weather Saturday, May 28 will be better. 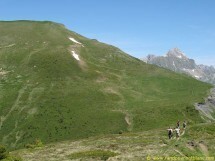 Browsing Ridge Ovens to the Col de Bassachaux (1778 m). Climbing on the head Lindarets (1950 m). From Montriond (55 km from Geneva), we walk on a panoramic summit. A circular hike.